The falcon's scientific name comes from the Latin word "Falco peregrinus." The term means wandering falcon, foreigner or traveler, according to Purdue University. 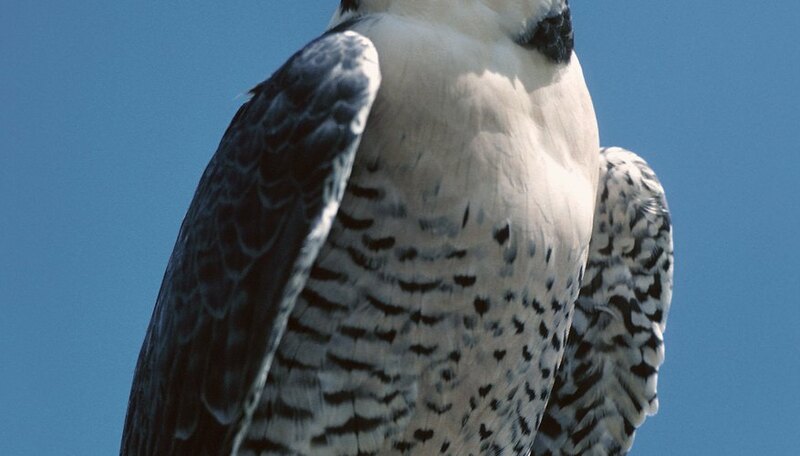 Falcons were removed from the U.S. Federal Endangered Species List in 1999, but as of publication, preservationists monitor the birds closely. Falcons have distinguishing characteristics and behaviors. A falcon is a medium-size raptor bird. Its black crown, nape and black wedge creates the look of a helmet. Its long, pointed wings are typically slate gray on the upper and back sides. Its throat and underside are white or cream, and it typically has black or brown bars on its sides and abdomen. It has blue eye rings and feet ranging from green to yellow, depending on the sub-species. Its sharp, hooked beak has a notch on the edge. Females outsize the males, or "tiercels." Females weigh up to 1,350 grams, and males weigh up to 800 grams. Falcons, one of the fastest predators, use a variety of techniques to seek, attack and kill prey. Falcons feed on small birds such as doves and pigeons, which make up between 20 and 60 percent of a falcon's diet, depending on its habitat. Falcons have excellent eyesight and can see their prey up to 1 mile away. 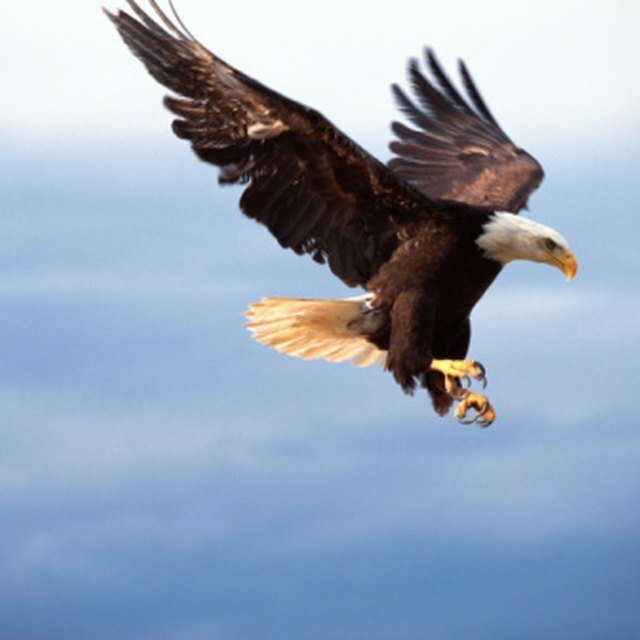 The birds dive, or stoop, at more than 185 mph and catch their prey by surprise, catching it in midair, so the speed kills the prey instantly. Unlike owls, falcons hunt during the day. Falcons reach breeding age when they are 2 or 3 years old. The birds have eight phases of courtship before mating begins. Mates attract one another, usually with the male performing aerial feats for the female, then roost together on a cliff. The two falcons then take hunting excursion and courtship flights together. This precedes courtship feeding on the cliff, mating and pre-nesting. The female lays three to four eggs, and both birds incubate them for four to seven weeks. They typically keep other falcons 3 miles away from their nest, or aerie. The chicks "pip" at the eggshells around hatching time, using a specialized egg tooth that falls off shortly after hatching. The mother stays with the chicks while the male brings her food. Falcons don't regurgitate their food for their young. Pate, Emily. "The Characteristics of Falcons." Sciencing, https://sciencing.com/characteristics-falcons-10048987.html. 25 April 2017.